My edition: Paperback, published on 13 August 2015 by Corgi, 480 pages. Description: Freya Moorcroft has wild red hair, mischievous green eyes, a warm smile and a heart of gold. 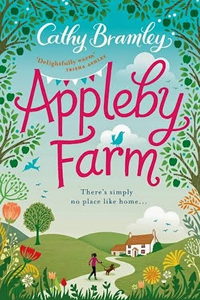 She’s been happy working at the café round the corner from Ivy Lane allotments and her romance with her new boyfriend is going well, she thinks, but a part of her still misses the beautiful rolling hills of her Cumbrian childhood home: Appleby Farm. 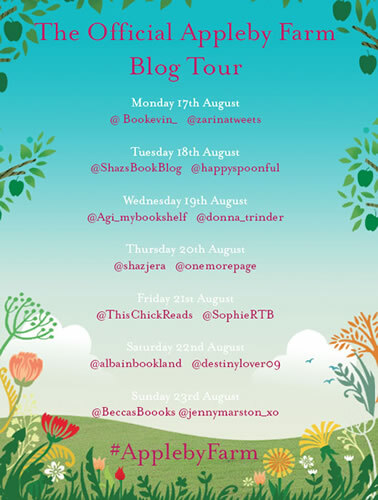 I loved Cathy Bramley's previous two novels, Conditional Love and Ivy Lane, and so I am thrilled to have the opportunity to review her latest paperback release, Appleby Farm, for the blog tour. While the main focus is on a new set of characters, there were some definite links back to her previous book, which made this a delightful and cosy read for both existing fans of Cathy's novels and new readers alike. Freya has always been restless, moving from one place to the next and trying a whole host of jobs along the way - usually not for more than a few months. When her friend Anna, who lives in the little town of Kingsfield, urgently needs someone to work in her mum's café for a short while, Freya jumps at the chance to pack in her dull job in Manchester and move to Derbyshire to help out Anna. What is supposed to be just a short stop turns into something longer when she realises she's actually enjoying working in the local café - and she finds a handsome boyfriend in the local Charlie. However, when Freya's uncle has an accident while working on his farm, she doesn't have to think twice about temporarily moving back to Appleby Farm to help out her family until her uncle is back on his feet. But when Freya arrives at the lovely home she grew up in, she realises things are far more grave for Appleby Farm than her aunt let on, and Freya has to make the difficult decision between her life in Kingsfield with her friends and Charlie, and her life in the Lake District with her family. This book is a big one. Without checking the page count of Cathy's other novels (because I'm writing this on Sunday morning and I'm just too lazy to get up and check my bookshelves), I think it's her biggest one thus far, yet it didn't feel that way at all. As soon as I started reading about Freya, I was swept away first back to the lovely allotments at Ivy Lane and soon after to the lush, rolling countryside of the Lake District and Appleby Farm. For years I've been wanting to go to the Lake District myself and while I still haven't had a chance to go, the beautifully detailed descriptions within this novel have single-handedly moved it to the top of my holiday wish list. It sounds that enticing, even with the nearly non-stop rain that hits Freya during her time with her aunt and uncle. Cathy has a really wonderful way of creating atmospheric settings for her novels that make you wish you were right there with the characters, and Appleby Farm is the most magical location yet. Despite all the troubles that hit Freya and her family along the way, all you really want to do as a reader is pack your suitcase and visit this delightful place yourself. And the characters too are utterly wonderful. Freya is a strong and likeable protagonist who has plenty of difficult choices to make on her journey to keep readers guessing until the very end. Thought it are the supporting cast members that for me make this such a fantastically written and engrossing read, from the adorable Lizzie at Appleby Farm and Harry at the neighbouring farm, right down to Charlie, Tilly and the rest of the Ivy Lane gang that make a reappearance throughout to make the novel even more exciting to those who read the previous book, as we get to find out what happened to the characters after the end of Ivy Lane. Appleby Farm is as lovely and homely as its title. When you dive into this romantic read you'll be rewarded with a delightfully sweet story, and after finishing that final page you'll want nothing more than put on your wellies and go for a hike through the English countryside. If only the farm was a real place so I didn't have to let go of the characters upon reading 'the end'. I'll just have to console myself by finally booking that getaway to the Lake District and exploring the beautiful scenery as described so wonderfully by Cathy.